(CNN) -- Swiss banking giant UBS confirmed a first quarter net loss of two billion Swiss francs ($1.75 billion) Tuesday and warned that the economy had continued to deteriorate despite a rebound in global stocks. UBS reported the worst losses in Swiss corporate history last year. In a statement, the Zurich-based bank said its losses were attributable to writedowns on risky investments now exited or being exited by its investment bank. "There has been an improvement in market sentiment during the first quarter, with a strong rebound in global stock market indices since early March, but the credit markets improved only partly and trading in complex financial products remains illiquid," UBS said in a statement. 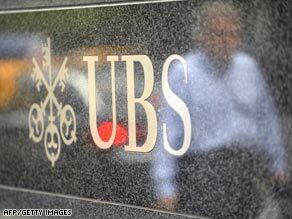 "The markets continue to be unsettled, and we remain cautious on the immediate outlook for UBS... The real economy has continued to deteriorate, and this is expected to have negative implications for credit-related provisioning in coming quarters." Last October, UBS offloaded many so-called "toxic assets" to a fund set up by the Swiss Central Bank as part of a government bailout deal worth more than $5 billion. But the bank said Tuesday it still had almost $250 billion in risk-weighted assets on its books. In February, UBS reported the biggest annual loss in Swiss corporate history of almost $17 billion, after writing down more than $50 billion in investments in complex U.S. financial products. The bank has also announced thousands of layoffs in cost reduction measures intended to cut operating expenses by $3.5 billion by the end of 2010.